Scott Budinger, MD, associate professor in Medicine-Pulmonary and Cell and Molecular Biology, showed that exposure to air pollution causes a stress response in the body characterized by an increase in the stress hormone adrenaline. Exposure to high levels of air pollution has been linked with increased risk for heart attacks and stroke. 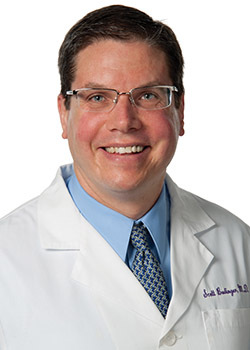 Scott Budinger, MD, associate professor in Medicine-Pulmonary and Cell and Molecular Biology, in collaboration with Gokhan Mutlu, MD, chief of Pulmonary and Critical Care at the University of Chicago, showed that exposure to air pollution causes a stress response in the body characterized by an elevation in the levels of the stress hormone adrenaline. The paper was recently published in the Journal of Clinical Investigation. The team has previously shown that exposure to air pollution increases the tendency to form blood clots. In the current study, the scientist used mouse models to demonstrate how increased adrenaline activates beta-2 adrenergic receptors on immune cells and promotes lung inflammation and a tendency to form blood clots. Similar to the effects of adrenaline, inhalers called beta-2 agonists that are used for conditions such as asthma or chronic obstructive pulmonary disease further worsen the air pollution-induced lung inflammation and clot formation. Budinger further explained that physicians still do not understand some of the unexpected side effects of commonly used beta-agonists such as albuterol, formoterol and salmeterol. Their results provide a potential explanation for these side effects and suggest that the current strategy of combining these drugs with anti-inflammatory agents might make these side effects less important. The study was funded by the National Institutes of Health grants ES015024, ES013995, HL071643, the Northwestern University Clinical and Translational Sciences Institute Center for Translational Innovation Pilot Award and the Veterans Administration.